The Cheapskate Intellectual© | Sustainability, spirit, and self-respect. Thank you for all your friendship and support of this, my first-ever foray into the internet/blog world. Now, with the help of the great people of New Digital, I’ve got a new website where the Cheapskate Intellectual blog will live, alongside news of and excerpts from my books, essays, stories, and other things. Visit the new site at https://amyeweldon.com/ and sign up for updates if you’d like to keep receiving Cheapskate news. Thanks again, and see you over on the new site! The answer, as anyone in the Upper Midwest can guess (channeling Prince) is C. And yet, despite more fierce thick snow today, it’s clear the general tilt of the earth is springward now. Sunday afternoon, I took my skis back out of the basement and toted them across the dike and toward the river. I made it for about a hundred yards before the wet snow clumped and made gliding impossible. On the runoff ponds on both sides of the dike, ducks — the first ducks I’ve seen this year – were dabbling. One, an adult Northern Shoveler, emitted a low burring call that sounded oddly like a train passing over a railroad crossing (chk-chk, chk-chk) to call the young one close again. Red-wing blackbirds filled the air with their distinctive, liquidy two-note song. A juvenile bald eagle looped overhead, looking for mice. Over under a young pine, a little herd of deer nibbled the low branches, then – inevitably – trotted back over the dike to look for more food in their favorite place, our neighborhood yards. The last had a gimpy left rear hock, darkened and swollen, yet it followed its fellows back up over the dike and out of sight. The title of this post comes from Dylan Thomas’s poem, which points us toward mortality and, because of that, beauty. Life keeps on going, beautiful and beautifully strange. Take, for instance, the weirdly compelling noise of rhubarb growing in the dark, which must surely also be the sound of that green fuse unfolding itself, of life detonating, up and up. Among the many prayers we must surely say in these times is, Lord, teach us to see and to hear. And thank you for the art, and the creatures, that share this mortal yet ever-turning world with us. The birds still know what time it is, and what is coming next. Later interpretation of the 1812 Luddite frame-breaking, via Wikipedia. 2) MZ himself, while clearly worried about his company and doing his best to play along with The Law, doesn’t, at one level, understand what all the fuss is about. He had a cool idea and built a platform to actualize it. End of story. And yeah, to the tech brain at its purest, that really is all there is to it. 3) We ordinary non-techies who thought we were just signing onto a cool way to share baby pictures had no idea what we were getting into, and still don’t, not really – although, to be fair, the signs are and have been there all along. (“If the site is free,” Jaron Lanier has been warning for almost a decade, “then you are the product.”) We just don’t know how to look, or how to describe what we see, when we open the notification that our data has been shared with Cambridge Analytica or that we have been victims of a Russian-designed fake political ad or when we download all the information it has on us. We don’t know how to describe that particular feeling of having been complicit in our own betrayal. The fact that we seem to be able to find no other language than the language of business — Is this a monopoly, Mr. Zuckerberg? Do you have competitors? How/should you be regulated? — is significant, and sad. Granted, that language can still feed Facebook into the legal mechanisms that are another social way of making statements about a common reality, and a common good. Problem is, business-speak can’t speak of everything there is that is worth speaking of. Tot up your expenditure’s on your child’s health care, education, clothing, books in terms of profit and loss and you see immediately the moral shortfall of such words. There is no way to say, literally, what a human life and the flourishing of a human spirit is worth, in financial terms. And that’s a good thing. Ditto natural resources – which is why trying to cast, say, the California redwoods into tourist dollars as a preservationist argument is a losing game. I keep going back to the tone of bafflement in the voice of senator after senator (“so, Instagram…is that, would you say, a competitor? A product similar to yours?”), to the note of betrayal in the voice of the data-exposed users interviewed on the radio. And I go back to that silence that arises when we try to put a name to what it is that Facebook is and what it has been the means of stealing, is the means of stealing, from us. When I tried to name this thing myself, I ended up filling Chapter One of my book The Hands-On Life: How to Wake Yourself Up and Save The World (a digest of which you can read in this article here.) I ended up relying on literature, history, and philosophy to do it – a combination of Hannah Arendt’s working against cliché in order to set precise meaning, in language, to experience and George Orwell’s concept of “ownlife” from Nineteen Eighty-four, that space of utterly inviolable privacy within one’s head, which is the ultimate site of resistance to tyranny by the state or, in our own age, corporations. And, oh yeah, my faith, which has the temerity to argue that human beings are something more than wallets, or fingers on our smartphone screens. We must judge a technology, too, by what new crimes it makes possible. Consider the dispossession of the Nottinghamshire weavers who became the original Luddites, and whose machine-smashing Lord Byron defended in his maiden speech to the House of Lords in 1812. Those mechanized looms are recognizable forerunners of our self-driving cars and 3D printers. Today – as outlined indelibly by Rick Moody in the new issue of Harper’s – we struggle to deal with identity theft. (In a rhyming of art and life too good to invent, Moody argues with the thieves via text message during a meeting of his Dante study group.) Consider the name of that crime. Identity theft. To shrug and say, of this or anything connected with tech, “well, versions of this have always gone on” may be strictly true but abdicates our moral responsibility to name our new reality in order to understand it. Being human beings, we have a great means of hope in our best creations: art, philosophy, theology, and language. These become even more important – as does the knowledge of our history – the farther into this weird future we go, and the more aggressively budget-cutting administrators attack these fields in our classrooms. (Maybe, just maybe, it might be nice to have some moral reasoning capacity in case your high-powered tech job lands you in front of a Congressional panel someday.) And therefore it is worth pressing ourselves to examine, very carefully, our impulse to sign on to our latest greatest “innovation” without examining and naming whether it is going to rob us of any, or all, of the things that make human a noble and important thing to be. As we watch the Facebook-in-Congress saga continue, we should consider this: Given the amount of agency we have ceded to this thing, our inability to name it, our silence in the face of it, should alarm us. Because it is worth taking note – very carefully – of what in human life or the natural world lies beyond the realm of the describable, and whether those things point to that which is life-sustaining (mystery, love, beauty, the vast web of ecology) or its opposite. If the cover image looks familiar, it’s because it was inspired by the World-War-II-era “Dig for Victory” movement referenced in Chapter Six. While I’m sympathetic to the view that unironic WWII/austerity nostalgia can be a dangerous thing, I am inspired by the idea of doing and making for oneself as a way to manage the practicalities of life in our increasingly resource-scarce era and the emotional realities of uncertainty and fear. It’s also a way, as Shannon Hayes writes in Radical Homemakers, to change one’s household from a unit of consumption to a unit of production, and thus, perhaps — my book’s thesis — to improve the way one looks at the world and one’s potential for agency in it. Big change starts small, in any place and time. This weekend I read Tara Westover’s new memoir Educated in one sitting. The story it tells is compelling: raised in a survivalist, fundamentalist-Mormon family in Idaho, Westover first attends school at age seventeen (her first day at Brigham Young University) and ascends to the academic heights of Cambridge University and Harvard, from which she achieves fellowships and a PhD, at the cost of her relationship with her family. On the surface, it’s a Horatio Alger story of success through hard work, although Westover resists that line. Indirectly, it’s a portrait of America’s preferred intellectual style, circa the early twenty-first century – reality is what I say it is, especially if I am an aging, fearful man, and woe be unto you if you disagree. And it invites us to reflect how education can help illuminate and confront this attitude as we work toward common truths and a common good. Westover’s portrait of her family echoes notes we’ve seen by now in the Bundy-family standoff and Ruby Ridge and end-of-days Internet rhetoric: suspicion of government and conventional medicine, lectures on “the Illuminati,” herbal remedies offered for everything from cuts and burns to traumatic brain injury. None of the characters are one-dimensional – Westover’s not that simplistic a writer, and they are, after all, her family – but the details add up to a portrait of a family held captive by a father’s fears (possibly reinforced by mental illness), which ripple outward and replicate themselves in everyone else. Westover’s mother trains herself as an herbalist and midwife, despite her initial hesitations. “Homeschooling” takes a backseat to work in the family metal scrapyard. Young Tara, visiting her grandmother’s house, is scolded for not washing her hands after using the toilet, which she secretly considers “frivolous.” Independence of thought is encouraged but selectively applied: the family keeps prepping despite the non-apocalypse of Y2K, and Westover’s father demands “proof” from her that her brother threatened her with a knife, although he witnessed it. Despite the beauty of the wilderness setting and the humor, grit, and self-reliance which do mark the family’s life together, its emotional temperature, set by the father, is clear: The truth is what I say it is. Educated depicts the power of self-isolation to spin a world around oneself that locks one in while calling itself freedom. Of course, this is a process from which none of us is immune. We’re all always struggling to keep the tents of our own small selves from collapsing in, a process both reflected and assisted by our own inescapable egos and by the echo chambers of pretty much anything with a screen. As someone who’s just published a book about growing your own food and developing independence as an artist and being mindful of technology’s power to overtake us from within our own heads, I’m constantly wondering where to draw the line. When does my distrust of Facebook and all its works slide over into tinfoil-hat land? Conversely, what is normal functioning in the world as it is (directing study-abroad programs, I do, alas, need a smartphone), what is healthy resistance (no cable, lots of books, trying to walk instead of drive), and what is conformity for convenience’s sake, shrugging your shoulders (oh, well, I don’t have anything to hide) and “checking in” online at that restaurant to get your 10% off coupon in exchange for your personal data? These are questions we all have to ask ourselves, in our world as it is. Perhaps one part of the answer lies in the degree to which meaningful contact with a range of people, places, ideas, and experiences different from yourself have allowed you to make mature decisions about what reality is and how it works. It lies in the education you have sought and the education you have received. (Denying children formal schooling is one way of keeping them at home, working in the scrapyard.) And this is where we go back to men, women, power, and that fundamental problem – reality is what I say it is – which repeats itself in societies and families, as the tyranny of the ruler authorizes the tyranny of the husband, the brother, the father throughout time and all over the world. (English feminist Mary Wollstonecraft, daughter of an alcoholic, abusive father, knew this well: “A great portion of the misery that wanders, in hideous forms, around the world,” she writes in 1792’s A Vindication of the Rights of Woman, “is allowed to arise from the negligence of parents.” Perhaps this inspired the shambling, lonely creature in her daughter Mary Shelley’s novel Frankenstein; we know from Educated that Wollstonecraft inspired Westover too.) Even a cursory look at history shows how we use the mind’s own fears to limit both body and mind, in our selves and in other people: gaslighting, intimidation, no-it-wasn’t, he-said-she-said, you’re-just-being-paranoid, on and on in a Bluebeard’s chamber of self-doubt and second-guessing. And gender matters here, as everywhere. Culture has made it a little too easy, for a few too many years, for men to run their ideas up the flagpole of personal belief and force others to salute, exiling women who insist on this power for themselves and encouraging all of us to neglect common standards of morality and judgment, right or wrong, the old-school golden rule, in the process. This is and has always been where tyranny starts: within the heart that insists I am entitled to have things all my way, all the time. Reality is what my own unexamined greed, fears, and insecurities say it is. Yet Westover’s memoir makes clear what this stance costs men themselves. Her brother Luke (a pseudonym) accidentally saturates his jeans leg with gasoline as he’s helping their father drain fuel tanks from junked cars, then suffers horrible burns when they catch fire. He can’t get the pants off because, lacking a belt, he has tied them up with baling twine, in a slick, firm knot. Charismatic, violent brother Shawn (also a pseudonym), who once badgered their father for safer equipment, falls twenty feet and hits a rebar-studded concrete wall on the way down. In a motorcycle accident, he suffers a traumatic brain injury, as their mother has years before. The father himself suffers burns, too, when a gas tank explodes, hot enough to melt his welding shield and the lower half of his face. Anyone who grew up in a rural world, as I did, will recognize the tangled risks and realities here: working hard to make money while lacking the money and time and mental space to equip yourself safely means you can cripple or kill the working body that’s your only means of support. And to be a man is to be tough, to move on, to keep going. Remember, ruefully, the voices you’ve heard from men you’ve known yourself, brushing away concern about finger-crushing trailer hitches or thick snaky brush: don’t worry, I’ll be all right. Because the work has to get done, one way or another. And we adjust what’s in our minds accordingly so we can live with it. Even though Westover herself, hewing throughout to understatement and her own experience, doesn’t make this leap, readers may find themselves wondering what her story says about our country, right now. Hard work, self-reliance, and healthy skepticism on the one hand, isolation, paranoia, dangerous disconnection from reality on the other hand, and both hands attached to the same body, fed by the same beating heart. This is the troubled soil in which the seed of “fake news” as accusations against The New York Times and The Washington Post have taken root. This points to what I saw painted on the back window of an apparently normal station wagon on the highway, driven by an apparently normal, late-middle-aged white couple: Certainly Not News, with the initial letters rendered as the CNN logo. This fuels the shameful contortions that render gun control as merely a matter of managing “mental illness.” This is how a country can watch as children are slaughtered in their classrooms – again – then watch as other children ask that the grownups ostensibly elected to represent them do something to keep them safe. This is how people can hurl hateful slurs and claim, against all evidence, to be innocent of their history and their meaning. The opportunity to participate in the making of their own mind, and the opportunity, and the responsibility, to check their own needs and versions of reality against a common good that supports humans and the nonhuman species and ecosystems with which we share our endangered earth. That is a pretty good definition of what education is all about, especially in a time when “truth” itself is at stake. Yet voices from beyond our own lives, from the past, can help us continue to seek it. “Truth is not with impunity to be sported with,” warns Mary Wollstonecraft, “for the practiced dissembler, at last, becomes the dupe of his own arts, loses that sagacity which has been justly termed common sense; namely, a quick perception of common truths—which are constantly received as such by the unsophisticated mind, though it might not have had sufficient energy to discover them itself, when obscured by local prejudices.” May we all continue to seek education honestly, forthrightly, respectfully, and bravely, and use what we learn to build a better world. A rerun from 2011 that’s been on my mind. Merry Christmas, y’all. Of course I teared up when I read this, my friend Amy’s Facebook status, in the week before Christmas. Of course I am tearing up right now, writing it and imagining these old folks, swaying, uplifted by memories dim and soft as shawls, wrapped around them and patted into place. Of course, this is not the first time, and won’t be the last, that I go to tearing up this holiday. Readers of this blog know by now that I believe tears are so often a sign of spirit – no other word for it – knocking, very gently, at a self-protective shell you have put between yourself and things that hurt. Sometimes the shell is necessary for survival: in the wake of a broken heart or a dear one’s death, you have to go on and teach your classes and go to meetings and smile at the teenage grocery-checkers at Fareway without losing it. But particularly for those of us who prize our independence and our self-control, accepting emotions as they arise and not fearing them can be a very good thing. Especially now, at the time when the skin of the visible world is cracking to let a mystery through — a mystery embodied and enfleshed and continually challenging. Our emotions, however riddling and difficult, can keep us open to this mystery in the softest and most welcoming way. 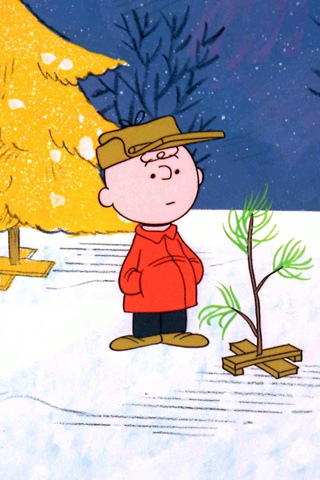 It is these feelings, so often unnameable and unsortable — not the inevitable blatherings about “war on Christmas,” or the garish commercialism — that, no matter what our creed or belief or place in life, can take us into the heart of what this season, in Charlie Brown’s words, is really all about. What moves me at Christmas? Things bound up in spirit and in memory. Lifting from its bubble-wrap nest my late grandmother’s nativity set, which sat on top of her piano and over which I hovered, careful as a child can be, lifting the baby Jesus out of his china manger and putting him back in. Reading Truman Capote’s “A Christmas Memory” and the Gospel of Luke (King James version only, please; Christopher Hitchens, RIP, describes best the reasons why.) Hearing, in Methodist churches in my deep-South hometown, black and white folks singing “Sweet Little Jesus Boy,” and listening to Mavis Staples sing it in my own house a thousand miles away. The world treats You mean, Lord. Sometimes, it treats me mean, too. But that’s how things is done down here. We didn’t know it was you. stuck in the tub of dirt, decorated with strips of red and green crepe paper and bits of lint cotton and streamers of tinsel and a little white cardboard star on its highest branch. And under the tree and propped against the tub was one lone gift, wrapped in red paper and tied with a green ribbon and with a red and green bow. The children had contributed nickels, dimes, quarters — money they had made from picking pecans — and Irene, Odessa, and Odeal James had gone to Baton Rouge and bought a pair of wool socks. The people sitting up front could see the package, and they knew who it was for, and at times I could see their eyes shifting from the choir toward the tree, and I could see the change in their expressions. The gift is for Jefferson: a pair of socks to care for his body, even in the face of the known fact of his death. For some time, my students and I pondered the theological implications of this: letting your grief come among you as a community, letting it be part of the weave of humble everydayness lifted, as a community, toward the divine. Ever so gently. Ever so small. One of y’all is going to have to read this passage aloud, I told them. I can’t do it. Little bitty Christmas trees break me up. I was joking, but only partially. And when I went back into that classroom to give those students their final exam a week later, they had drawn, on the board, a Christmas tree (helpfully labeled “little bitty Christmas tree.”) A bit of final-exam mercy? they joked, eyes bright. We laughed, but we also all remembered experiencing that moment in the text together, thinking together about what community means, what incarnation means, how human beings can touch the rough and humble surfaces where our world meets the divine. It’s just such a moment that Gaines writes into his novel: the stakes are high, a man is going to be put unjustly to death, and this is when we need to look, and need to let ourselves be moved. Not look away. Not choke back that pity, that anger, that mysterious emotion, whatever it is. The stakes are pretty high for our world too, and are only going to keep rising. But when I try to wish peace into this world, and into the lives of my friends and my family and my students, this is the kind of peace I’m hoping for: that in the middle of bewildering and riddling emotion, memory, difficulty that never really goes away, we find that moment of quiet, homely grace in which we may be strengthened, and moved, and encouraged along the path of thinking and caring and acting. If tears come, let them fall. They’re a sign of something moving, something real and true, whose presence — however we may experience or think of it — sustains us and moves us forward too. The wealthy and the big corporations will love this. Few others will, especially considering its continued and systematic destruction of the environment, of health care access, and of higher education. Last I checked, this bill will open to taxation the already-laughably-small stipends of graduate students — just like the ones teaching your kid’s freshman comp class at the nearest Big State U and hoping to pursue the vanishing dream of tenure-track teaching and intellectual nourishment of the next generation. Student loan interest deductions — like those claimed by almost every human being under 60 that I know — go away as well. Remember all that controversy over limiting 401(k) and 403(b) contributions a few weeks back, which had me staring at my radio in disbelief: is this really the “conservative” party, endangering retirement savings? Retirement savings? And I quail before the disaster that this will wreak upon health care. By every measure, the poor and the precariat — that clinging-on-class to which more and more of us belong — are getting poorer, more precarious, separated from disaster by vanishingly thinner margins. And this bill promised only to continue that. Lots of us from all walks of life saw and spoke and wrote and phone-called our “elected representatives” against this. And yet it went through anyway. A clearer gesture of contempt for ordinary non-billionaires and what used to be thought of, optimistically, as our common good — clean environment, access to health care, educational opportunity, and, therefore, the opportunity to leverage ourselves up into something better than what we are right now — could hardly be imagined. Reading this news, as I set aside a stack of papers by first-year students (not a one of whom, by the way, would’ve submitted pages that look like this for a grade), one phrase of Sen. Warren’s lingered in my mind: cram through. Unwillingly, dismally, I thought of the other shameful farce making its way through our public life: the sexual greed and power-abuse of women by powerful men. Is it any accident that such an approach to force — cram through, intimidate — is surfacing in public life from Hollywood to Google to the Harasser-in-Chief? Isn’t this the common thread in the bankrupt toxic-masculinity play staining screens and attention spans everywhere? Force your rampant greed on others. Slap a dollar value on everything, whether it belongs there or not. Impress-upon, break, fracture the bodies of women, children, the vulnerable, the Earth, the thawing tundra of Alaska whose very thaw, I read, now ironically makes it easier to lay in broadband cable. (Just what we need: more Internet, more social media portals through which our short-sightedness and credulity can be turned to someone else’s advantage.) Behold our republic as 2017 hurtles to a close: borne along by greed, hubris, and hucksterism to — where? What’s wretchedly infuriating and sad about the trickle-down myth still parroted by supporters of this bill — give corporations a break and they’ll help the rest of us out! — is that it’s so obviously at odds with reality. Look around, y’all. You really still think that corporations care about us? Especially the “small businesses” driven out by big-box stores in your town and mine? Look around at the threadbare, warming world in which we non-billionaires live: potholed highways, collapsing bridges, paycheck-to-paycheck scrimping, and, as I write, a 50-degree afternoon on the second of December in the upper Midwest. You really think that trickle-down dream is going to work if it hasn’t by now? You really think corporations love us and want us to be happy? (Maybe that question needs a period, like the similar reality-confrontation from the girl in Hemingway’s “Hills Like White Elephants.”) You really think you can continue to build your own life in a bubble, untouched by what makes All Those Others Less Fortunate? How many more decades do you want to give these people to do the right thing? How far into your children’s, then your grandchildren’s, lives do you really want to wait for them to accept what it is not in their interest to see? Behind all this is the same fallacy Laura Kipnis has identified as fueling the sexual harasser preying on his underlings: the fantasy of self-determination and power in a world in which we are interdependent, whether we like it or not. Sen Warren famously busted the frontier-hero myth a little while back: “you didn’t build that.” Flannery O’Connnor busted the Misfit’s belief, too: I don’t need no hep, I’m doin all right by myself. Sure, we’ve all got to work hard, be self-sufficient, push ourselves to do and be better. I’m a single 43-year-old woman who knows this as well as anyone, and teaches my students the same: if you don’t make it happen for yourself, nobody else will. But the spiking anxiety I see in them is no accident. We have made the world they are living in, in which we are all one natural disaster or health emergency away from ruin. Those of us GenXers in our late 30s and early 40s, raised on the work-hard-get-a-degree rules beginning to crumble as we entered graduate and professional school, are now finding these ostensibly stable degree-requiring careers (medicine, law, the professoriate) eroded as we also witness the erosion of once-stable values: Expertise matters. Facts matter. Reality is…you know, a thing. Not everything in a worthwhile human life, or in the nonhuman world granted to us to share, can or should be measured by dollars and cents. When, exactly, did these become controversial? “By their works shall ye know them.” What you do, not what you say, tells me who you are. So it’s time to hold these people accountable. Here’s who voted and how. And let’s push them — and ourselves — to do and think better. What does “pro-life” really mean if not respect for the dignity and ability to thrive of living children on a living planet? What does “small business” really mean if the rules are different for a billionaire than they are for you? What does “personal health and wellness” really mean if a corporation can poison aquifers and we let them do it? What does “faith” really mean if if doesn’t push us past regarding our selves and our present needs as if that’s all there is to reality? We can do better than this, y’all. We don’t have a choice anymore.